The United States Has a Two-Party System - Fact or Myth? The United States of America has a two-party system. Does The United States America have a Two-Party System? If we define a two-party system as a political system dominated by two major parties, then the United States has a two-party system. If we define a two-party system as a system in which only two parties participate, then the United States doesn’t have a two-party system. The reason the United States has a two-party system in practice is because winning Presidential elections require a majority win (especially when trying to win Presidential elections given the “winner-take-all” rules for 48 States and D.C.). Consequently, people tend to gather into two big groups under two big tents for practical purposes, and then that cycle is strengthened over time as funding, support, and loyalty for a given major party grows. This creates two behemoths that can’t reasonably be stopped (a political duopoly), it creates political machines and what we used to call “bosses” which can’t reasonably be replaced, and tens of millions of loyal voters and tens of thousands of corporate entities who can’t reasonably all be expected to change allegiances (even when a popular Progressive or States’ Rights party comes to the forefront). Thus, citizens, groups, and politicians are incentivized to band together into two big corporate funded (since Citizens United) groups instead of building minority parties (although third parties do form and play an important role in this two-party system, as we will explain below). Given the above, a third party win is next to impossible for Presidential elections. Whatever group, be they left or right, needs to not only beat the opposition party, but needs enough votes to beat the similar party. For example, for Green to have won 2016, they would have needed to beat the Republicans roughly 63 million votes and taken the Democratic Party’s roughly 66 million… despite lacking all the funding, support, and loyalty of a major party. But for 2016, Green didn’t meet this mark, instead Green got 1,457,038 votes nationally, which far more than what Clinton needed to ensure a Democratic Party win in a state like Florida. I’m not saying the numbers are connected, they aren’t, and the Green Party’s Stein only got 64,399 in Florida. I am only saying Green was 60 million votes short of winning and the other left party was only a few hundred thousand state popular votes shy of a Presidential win. With the above said, this grouping into two big tents doesn’t just effect Presidential elections, it has ramifications for Congressional elections as well. Generally, all historic Presidential election wins have gone to a major party candidate, and often the same is true for the House and Senate who rely on funding and support from the major parties. Over time, as districts are gerrymandered and media and culture present a constant implicit bias toward the major parties, the cycle then repeats and strengthens itself, as you can see illustrated in the image below. TIP: Many historic nations have had two-party systems, the system sometimes arises from convention (such as from the need to gain a majority), but a two-party system also speaks to the more natural political dichotomy we see in left-right politics where people are generally split into “two types” liberal and conservative. 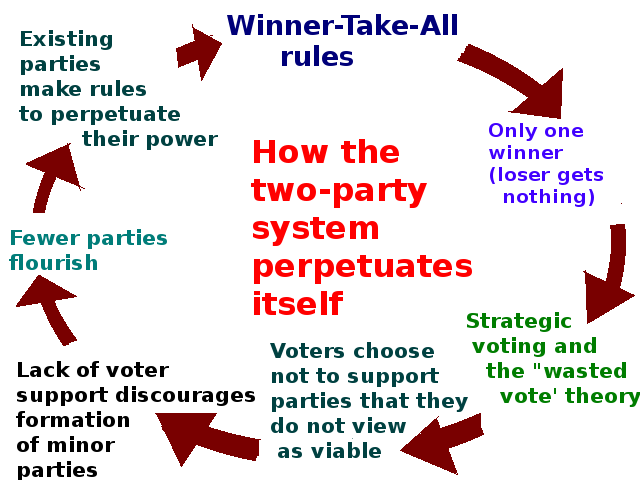 Why the winner-take-all system leads to a two-party system in practice despite there being no official two-party system in the U.S. (source). The Dollars behind the sense: It is also worth noting that it takes a ton of money and boots on the ground to compete with either major party. The political machines that arise are arguably more a response to the reality of coordinating a 50 state campaign than they are a testament to some shady plot. Speaking of money, above I mentioned Citizen’s United. One might think that campaign finance reform will fix everything, but from what I understand from works like VO Key’s Southern Politics in State and Nation (a classic work of political history that discusses one-party politics in the South, explaining why certain businesses have sway in rural areas), money in politics has always been a thing. Citizens United only did away with the pretense that it wasn’t OK and made things easier and more transparent. So even if one “reforms” the system, they only accomplish so much unless they account for that fact. Learn more about Campaign-Finance Reform: History and Timeline. Despite everything noted above, many different parties run in local, state, and federal elections, and the concept of parties isn’t even mentioned in our Constitution. Given this, we can say without a doubt that the United States isn’t technically “a two-party system”, it is just acts like one in practice (there is a “two party culture” so to speak). Consider in the 2016 election, four viable parties ran for President (these were the only parties on enough state ballots to win the Presidency; “viable” isn’t a comment on local races). These were the Republican, Democratic, Green, and Libertarian parties. Meanwhile, many minor parties ran in some states or state and local races, including Constitution and Socialist parties. The above is easy enough to prove, all we need to do is look at historic elections (where we can confirm the major parties dominate) and then look at the parties who run in a given year (where we can confirm more than two participate in government). This page is about explaining “the why”, the proof is easily shown. Below we will further explain the ways in which the United States political system is and isn’t a two-party system, adding vital details to the conversation, and importantly explaining why other nations who use a parliamentary system (where coalitions are formed after being elected to office, not before like in the U.S.) don’t have the same exact problem, but why ultimately everyone is going to be part of the large global unofficial two-party system, the political “left” and “right” (be the debate be about globalism and nationalism, communism and fascism, or liberalism and conservatism; men by their nature come in two types, and we call these types left and right). Thus, the frustrating reality here is that, since the U.S. isn’t a parliamentary system, third parties often in practice “split the vote” of the party they are most like. FACT: When two entities dominate something it’s called a “duopoly.” Many countries, especially those with parliamentary systems have more than just two viable parties. Majorities are built after elections through coalitions and majorities aren’t needed. We will compare the U.S. to other systems below to better illustrate that we are discussing practical, not ideological, matters here. TIP: The way Wikipedia frames this argument is slightly different from the way I see it. Their facts are correct, it is just a different frame. As they note, “two-party” is a loose term that describes “an arrangement in which two major parties dominate elections, but in which there are viable third parties which do win seats in the legislature.” They point out that there was a “one-party system” under Monroe (that is true). For a 101 level look at the matter, it is important for Americans to understand they aren’t limited to the current major two parties. Instead they are just restrained in their options by the reality of the system in place. TIP: One can argue that, the system in place aside, two-party systems aren’t ideal. In fact, the two-party system creates what I would call a “tyranny of the duopoly,” which can at times divide the house much to the detriment of the country. TIP: Every state except Nebraska has a bicameral legislature consisting of a higher and lower house (typically referred to as state Senate and House respectively). A third party win at the “state level” is more likely than a win at the “federal level” for the federal Senate and House. It is also more likely in local (regional) races and other state-level positions. It is very rare in more highly contested federal elections where the organizations backing the major parties focus their efforts, and the voter-base is more likely to come out in support of a major party. Learn more about how voting works. TIP: The Constitution doesn’t mention parties, but it does require “majorities” to win elections (as do many states). The necessity of building coalitions that result in majority wins helps to influence the “two-party culture” of the United States in practice. Things like the spoils system only reinforce this. This truth encapsulates the answer to the question “does the United States have a two-party system?” Like almost everything else in life, it is complex and somewhat semantic. TIP: The winner-take-all system and electoral college are two totally different things. Learn more about the origin and purpose of the electoral college (and how it has been changed by state based rules). TIP: It may be frustrating to watch parties divided when neoliberals and progressives can’t agree, or when the old gaurd Republicans can’t agree with the Tea Party populists, but that doesn’t mean the Green Party or the Constitution party aren’t valid parties or that the U.S. literally has a two-party system… it just means the “wasted vote” (spoiled vote, split vote, etc) theory isn’t a total myth. It is important that we frame the complexities in a truthful way when discussing our political system. A well educated voter will understand the impact of their vote and not put ideals before reality in most cases, but in all cases, one needs to vote their conscious (that is what American liberty is all about). FACT: Despite the many parties that run in practice, a third party candidate has never won the Presidential race and has rarely won a federal Congressional race. While a win at the state or local level is slightly more common, it doesn’t often happen in practice either. Thus, while third parties can technically win, they rarely do. As noted above, the simplest proof that the United States of America isn’t technically a two-party system is the fact that Presidential Candidates from many minority parties were on at least some state ballots for 2016. These include Democratic, Republican, Libertarian, Green who are on all or nearly all ballots, Constitution which is on more than 20 state ballots, and Independent, Socialism and Liberation, Reform, Socialist, and Socialist Workers who are on less than 20 state ballots. Not only that, but there are many more state-based parties like the Legal Marijuana Now Party-Minnesota and Nutrition Party-New Jersey, for example. If you live in Oklahoma, you could even vote for Joseph “Joe Exotic” Maldonado. Below we cover the history of third parties in past elections and how they relate back to the two major parties of any era. First, a video on the 2016 third parties. Who Are The Third Party Presidential Candidates? Most people would be shocked to know they have more than two options, but then again about 40% of eligible voters don’t vote, and people often forget about the countless other races and ballot measures happening in any given election. Learn more about how voting works and don’t forget to vote in the Nov. 8, 2016, general election in which the Presidential election takes place. First, we have to point out that the names of the major parties have changed over time, but even when the names changed the same general factions were in each party (except as is detonated by the Party Systems where the notable change is that elite progressives and southern states’ rights conservatives swap positions from FDR to Bush, especially notable is Civil Rights and Voting Rights and the 1968 election). Major party 1 “the Big Government Party” (the pro-northern and later coastal party): Federalists, Whigs, National Republicans, Republicans from Lincoln until the late-1800’s (and temporarily “the Union”), and then Democrats after 1930 especially after the 1990’s. Major Party 2 “the Small Government Party” (the pro-southern and later middle party): Anti-Federalists, Democratic-Republicans, Democrats until the late-1800’s (and temporarily the non-party “the Confederates”), and then Republicans after 1920’s (Harding, Coolidge, Hoover), but especially after 1990’s. Notable Third Parties have almost won or “spoiled the vote.” These include, but aren’t limited to, the Free Soilers (Van Buren Democrats who didn’t go full tilt Confederate), the Know-Nothing (pre-Tea Party northern nativists), the People’s Party (the progressive party that changed the Democrats starting in the late 1800’s; reaffirming their Jeffersonian roots in the Gilded Age), the Progressive Party (Teddy Roosevelt’s party that split the vote in the progressive era resulting in a loss for Taft and win for Wilson/Bryan; a more aristocratic form of progressivism than Bryan), the States’ Rights parties (that split some votes starting in 1948 as race became an issue again after WWII; the Solid South Dixiecrats who mostly “switched”). TIP: See an essay on how the parties switched over time. We can talk about William Jennings Bryan, how modern Republicans can be total Big Government Statists on issues while using States’ Rights as a modern excuse for pro-business policy, or how the Democrats want States’ Rights for Medicaid expansion, but for our purposes here we are over simplifying to make a point about the major parties (without having to give a full history lesson). The only real note on the above is that the Democratic-Republicans of the early 1820’s were so popular we essentially had a one party system. That one party system was still of the Democratic Party linage, but it is very notable that Federalists like John Quincy Adams were in the party. Thus, although there have been oddities like name changes and the Democratic-Republicans of the Era of Good Feelings, there have always essentially been two major parties. Here we can note that none of “the two major parties” listed above ever lost a Presidential election to a “third party,” and their members rarely lost a Congressional seat to a “third party” either. For example Teddy’s Progressives splitting from Taft ensured Wilson’s Presidency and started the changes that turned Republicans into their modern Small Government form (pushing their progressives to the Democratic Party under Presidents like FDR and LBJ). So, big impact, but no actual third party win! That is important to grasp, because that is a likely reality of what a major third party means. The National Republicans , Whigs, and Republicans were all consciously formed by members of the old Federalist line after the party’s had dissolved. That isn’t the same as “a third party win”, it is more like a name change and a split from some factions (in those times, groups like Free Soilers and Know-Nothings). As noted above, although America isn’t “a two-party system” in any technical sense, it is essentially a two-party system in practice in the Presidential and Congressional elections. We know that third parties can win, they just rarely do in practice. Third parties have never won the Presidency and have rarely won seats in Congress. However, some successful third party candidates have historically upset one of the two major parties when they got enough traction. Notable third parties who affected elections include some parties eluded to above like Van Buren’s Free Soil Party, Bryan’s Progressive Free-Silver People’s Party, Teddy’s Progressive Bull Moose Party, and George Wallace’s States’ Rights Party. None of these parties won their elections, but they did upset key races and changed outcomes different ways. Although third parties have sometimes gained seats in Congress, today in the Senate and House we have all Democrats and Republicans and one Bernie Sanders (Independent / Democratic Socialist), so historically and presently an upset is very rare on a federal level (President, Senate, and even House). Congressional and Presidential elections aside, we have positions within states and regions on the local and state level that can be won by libertarians, constitutionalists, socialists, independents, etc. Those who want a third party should focus on local third parties, while those who feel less strongly should vote tactically. In all cases, I suggest VOTING DOWN THE BALLOT and VOTING ON STATE LEGISLATION CAREFULLY as sometimes bills get confusing names. Consider the down ballot Democrats or other social liberal parties and legislation, or local Republicans and other conservative parties. Vote with your conscience. Although positions are dominated by Republicans and Democrats in government on a local, state, and federal level, we have more than two parties seated today, and way more than two running in each election. TIP: There are many elections on each election day. The Presidential race is only one of many races. In my state of WA, we are voting on campaign finance, state income taxes, and a minimum wage increase. Elections are a big deal and your vote counts! TIP: See our pages on third parties for more discussions on the past third parties who changed party politics. Party Systems: Crash Course Government and Politics #41. TIP: It takes 270 electoral votes to win the Presidency or simply “a majority” if more than two parties show. In Presidential elections, a popular third party can split the vote, and either push the vote to the House or upset the election and push the electoral votes toward one major party. In one odd case in 1824 four Democratic-Republicans ran against each other and split the vote (the feelings were so good in the era of good feelings there was a brief respite from party politics). The House voted in a “corrupt bargain,” and things got so ugly the next election saw two bitter factions facing each other, Democrats and Whigs (the party that becomes Republicans). See the 1824 election. TIP: The whole “red state” and “blue state” issue started in 2000 during the Bush election. Before that, there was no set color for a party. TIP: See Party Divisions of the House of Representatives* from 1789 to present. 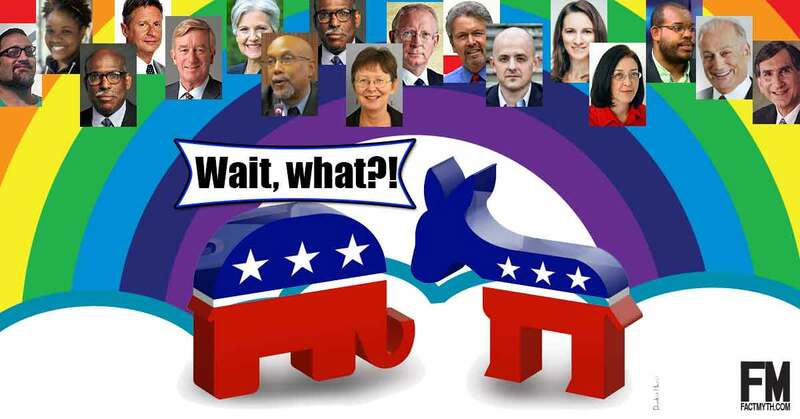 The names and positions of parties have changed over time, see our page on the parties switching platforms. George Washington specifically warned against America and the founders against creating parties and refused to join one himself. Madison warned against them as well although he noted that they were inevitable. That didn’t matter much as it did that Alexander Hamilton and Thomas Jefferson immediately formed the Federalists and Anti-Federalists respectively to oppose each other. In every country, these two parties exist, and in every one where they are free to think, speak, and write, they will declare themselves. Call them, therefore, Liberals and Serviles, Jacobins and Ultras, Whigs and Tories, Republicans and Federalists, Aristocrats and Democrats, or by whatever name you please, they are the same parties still and pursue the same object. The last one of Aristocrats [elite Republicans, conservative, center-right, toward aristocracy] and Democrats [populist Republicans, liberal, center left, toward democracy] is true on expressing the essence of all.” —Thomas Jefferson to Henry Lee, 1824. ME 16:73 See also realist vs. idealist, empiricist vs. rationalist, and other fundamental dualities. Also, see physiological differences in conservatives and liberals. The First Two-Party System (US History EOC Review – USHC 1.6). In parliamentary system (like most Europeans have) parties are voted into parliament and then the build coalitions to get a majority by working with other parties. In the U.S. different factions band together under a party outside of government, and then we elect officials who have allegiance to a party going into an office. This means coalition building is sometimes less likely to occur (to the extent that ALL Republicans tend to stand lock-step against ALL Democrats). Both systems can be described as democratic forms of representative republics, but our specific system tends to create a “two-party culture” although notably, Britain has a two-party system of sorts as well, despite their parliament. Democrats are comprised of the factions: progressives, social liberals, and neoliberals. Or simply, populist socially progressive left-wing and pro-business Democrats. Republicans are comprised of: libertarians, paleocons (social conservatives), and neocons. Or simply, populist right-wing socially conservative and pro-business Republicans. Meanwhile, the third parties tend to be single-issue voter parties are more radical ideology voter parties. For example, Green is single issue environmental and otherwise an extreme of progressive. Libertarian is an alternative to the libertarian wing inside of the Republican party. It’s less about the paleocons and essentially anti-neocon. Constitutional is a paleocon party. All the socialist parties represent the socialist positions not welcome by the major parties. A parliamentary system would allow for all these groups to declare themselves with more nuance inside government. Ours does not tend to do this in practice. This creates endless confusion in the general population who can’t figure out why, for instance, Obama wants the TPP and Bernie opposes it, or why the Bush family can’t stand Trump. It is because we are discussing a number of factions in big tents who are divided within the party, but more-so opposed to what the other team is doing and agree on general stances on key voter issues (as is reflected by the planks of the party platforms). Learn more about liberalism vs. conservatism and the basic types of political parties. Parliamentary vs. Presidential Democracy Explained. TIP: See everyone else on the ballot from Poltics1.com. The above is just some quick visual proof that “two-party system” refers to what happens in practice due to the need to win a majority, not how many parties actually participate in U.S. elections. It is a myth the United States has an official two-party political system, although there is clearly and provably a two-party system in practice. Framing this as “the two current major parties are the only parties that can ever exist” is somewhat of an affront to our democratic nature as it presents a skewed version of American politics. The proof that we don’t have “a two-party system” can be found in the Constitution and is evidenced by just about every election in history. With that said, evidence that we have a two-party system in practice despite not having an official one can be confirmed in the same way. The nuances may make discussing things more complicated, but we have a duty to keep things accurate more than we do to keep things simple.